From a primitive naïve and simple character, Harlequin evolves into a smart, more sophisticated one, that with his simplicity outwits all the arrogant and greedy personages with whom he interacts. And the evolution (and decadence) is well marked by the changes in its mask, his stage "persona", which goes from an almost savage and Zanni-like appearance to the witty and ironic guy we mostly remember. His character was definitely a success as changes in the Italian Comedy were surely determined by the public's acceptance of gags and characters, and due to the partially improvised script, changed from day to day, I speculate. The evolution of the character went on until the 18th century, when it became too sophisticated, no more wit, the hunger and fantasy gone. And the Commedia dell'Arte is going towards its end. It brings a strong resemblance with the "omo salvadego" impersonation. Mainly used in the late 17th century, It was later replaced by a more sophisticated and "less savage" one. Another Harlequin's primitive mask, made of wood. This would be the most known mask for a couple centuries, and serve as model for a more sophisticated masks made in leather, typical of the late Harlequin's impersonations. 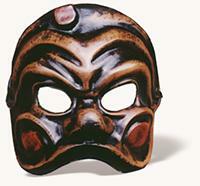 A more modern and widely known mask that Harlequin wears on stage. Usually made of leather, like most of the other Commedia Masks, still holds the features of the older ones including the bump on the head.